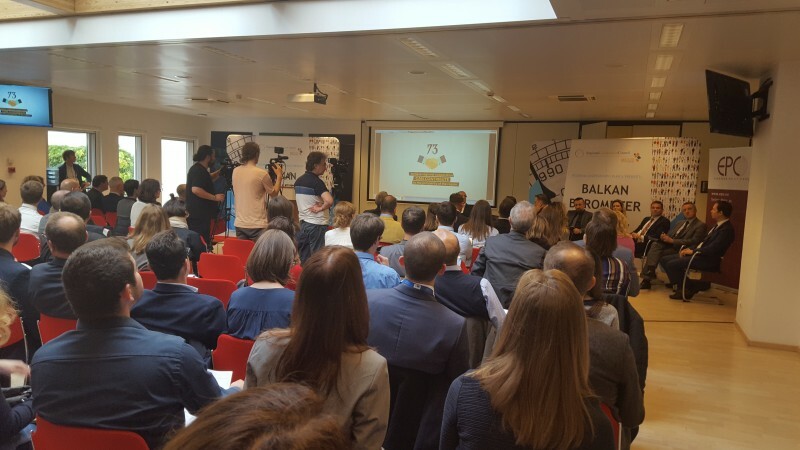 Brussels – The Regional Cooperation Council’s (RCC) presented in Brussels today the 2017 edition of the Balkan Barometer (BB), an annual survey of citizens and business communities’ opinion on the situation in the region. “While there is further evidence of economic recovery across a number of the region’s larger economies, unemployment remains the chief concern. Worryingly, the Barometer highlights ever growing anxiety over corruption; in BB 2015, 15% rated corruption as one of the key problems for the region. The number was up to 27% in 2016 and is now at 32%,” said RCC Secretary General, Goran Svilanovic. “An upturn in economic performance by the region’s economies has brought about an increasingly optimistic outlook for the future that needs to be solidified through decisive government action. While it’s hardly news that the region has much work to do, our hope is that the Barometer’s findings will help set the agenda that will ultimately spur further growth in the region, especially having in mind the implementation of the RCC-prepared Regional Economic Area Multiannual Action Plan which region’s leaders endorsed in Trieste this summer” added Svilanovic. Despite notional support for European integration there continues to be widespread scepticism about the region’s short to medium term accession prospects, with 28% of respondents saying they believe EU membership will never happen, the Barometer shows. Maciej Popowski, Deputy Director-General for European Neighbourhood Policy and Enlargement (DG NEAR) reiterated the European Union’s readiness to continue supporting the Union’s enlargement, as expressed in EC President Junker’s vocal messages to Western Balkans’ economies. Presenting the key findings of attitudes, experiences, aspirations, perceptions and expectations across the Western Balkan economies, Vladimir Gligorov, GfK Expert Consultant and Researcher at the Vienna Institute for International Economic Studies, stressed that business people continue to struggle with what they see as complex taxation and an unfriendly business environment with an unpredictable legal system. “62% of business people in the region perceive very hard or hard to start a private business in their place of living. More than half of them (51%) believe that upgrading roads would have the most positive effect on their business. While 56% of respondents agree that the government takes note of their needs, but only to a limited extent, it is positive to record the decline in the number of respondents who feel ignored by the authorities (down to 30% from 38% in 2015),” said Gligorov. The BB 2017 launch, has been organised by the RCC in cooperation with European Policy Centre (EPC) – an independent think-thank. Participants of the BB 2017 panel discussion included also Vedran Dzihic, Co-Director of Center for Advanced Studies, South East Europe and Senior Lecturer at the Institute for Political Sciences, University of Vienna; Nikica Mojsoska Blazhevski, Dean, School of Business Economics and Management in Skopje; Jesper Johnson, OECD SIGMA; Mark Vasic, Senior Manager for International Regulatory Affairs, Deutsche Telekom AG; Davor Dubravica, Chairperson of the Regional Anti-corruption Initiative; and Orhan Usein, Team Leader of the RCC's Roma Integration 2020 project; and Corina Stratulat, of the EPC, moderator of the panel. Balkan Barometer (BB) is an annual opinion survey commissioned by the RCC and conducted by GfK, collecting and analysing data from region's citizens and businesses across a variety of thematic areas such as employment, trade, investments, corruption, etc. Its 3rd edition included 8000 citizens and 1600 companies.